Bratwurst or dark sausage sliced into coins. Garnish: Lingonberry or other tart jam. Cranberry sauce works in a pinch. For the sausage, herring, or veggie replacements cut into Tak playing piece shapes: Cane or Miter. In fancier establishments, these bites will be pre-assembled in the order shown above, with one piece of each ingredient stacked up. 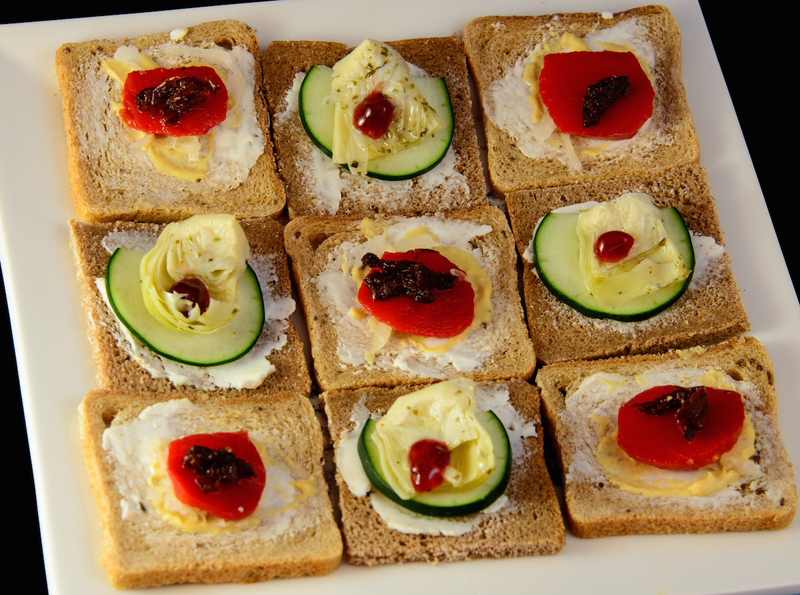 Each individual open-faced sandwich should be approximately one- or two-bite sized to keep players hands free and clean for playing. 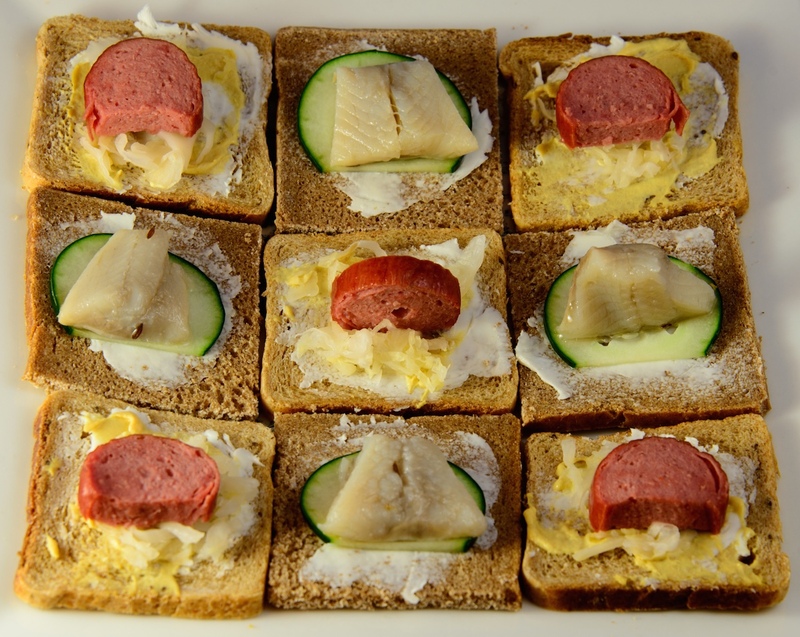 Assembled, each sandwich should vaguely resemble a move on a Tak board square with either a Cane (sausage or mushroom) piece or a Merchant (herring or artichoke) piece on top. Very fancy plating of this hors d’oeuvre alternates the dark pumpernickel squares with the light rye. In more casual locations the ingredients are served on a platter for players to assemble themselves, usually during their opponent’s turn. *Pumpernickel bread may contain cornmeal, and both pumpernickel and rye may contain corn syrup. If you make your own though, these breads can easily be corn-free. I wrote this recipe as part of a stretch goal competition for the @TakBoardGame Kickstarter, which you can find until May 20, 2016 at tinyurl.com/takgameks #takgamerecipe. After that I’m sure you’ll be able to find information from the creators Patrick Rothfuss, author of some truly wonderful books, and James Ernest, designer of some truly wonderful BRAIIINS … I mean games. I was attempting to think of a recipe that reminded me of (European) epic high-fantasy foodstuffs–mead, meat pie, ale, pasties, etc–but yet was snackable and kept your hands clean enough for playing a game. 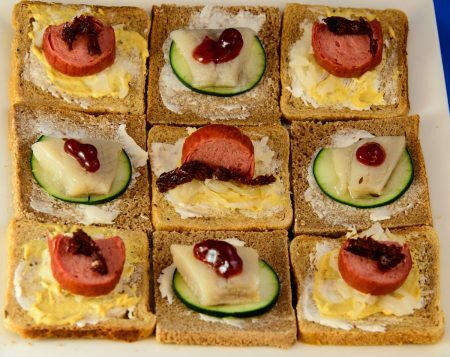 This is essentially an aesthetically-designed version of Danish open-face sandwiches, Smørrebrød. You can honestly put anything on these that you want, but as you can see from the blog, we’re focused on avoiding several food allergens, so we don’t use staples you might prefer, such as cheese. Mix water and food coloring. Mix sugar into water and food coloring. Add mijin-ko and mix until the dough holds finger marks. Dust your molds with katakuri-ko. Fill molds tightly, and tap out onto a plate. These are dry sugar candies – and go well with the tea ceremony. Shapes of these candies are seasonally linked and generally very specific. Since I only have a few molds, those are what I plan to make. If you do not have rakugan higashi molds, you can buy candy or chocolate molds at many craft supply stores. They’ll hold you over until you can make a friend in Japan to send you some molds. 2 ¼ cups white, short-grain, Japanese rice (or medium-grain California rice). Broil the salmon until justflaking. Cook the rice. Add rice vinegar until the flavor of the rice is right–like sushi rice. This should be ¼ to ½ cups of rice wine vinegar. Make tightly-squished balls of rice with bits of salmon hidden in the middle. Using an onigiri mold makes this easy. You can put other things in the middles too! 3.5 Cups Soymilk — must be plain, unsweetened, unenriched. The ingredients should be soy and water. 1/4 Cup Sweetener — try honey first. Mix soymilk, sweetener, and 3/4 tsp gelatin. Bring the soymilk/sweetener/gelatin to 180F (not 212!). Stir it so as not to burn it on the bottom. Set it aside. 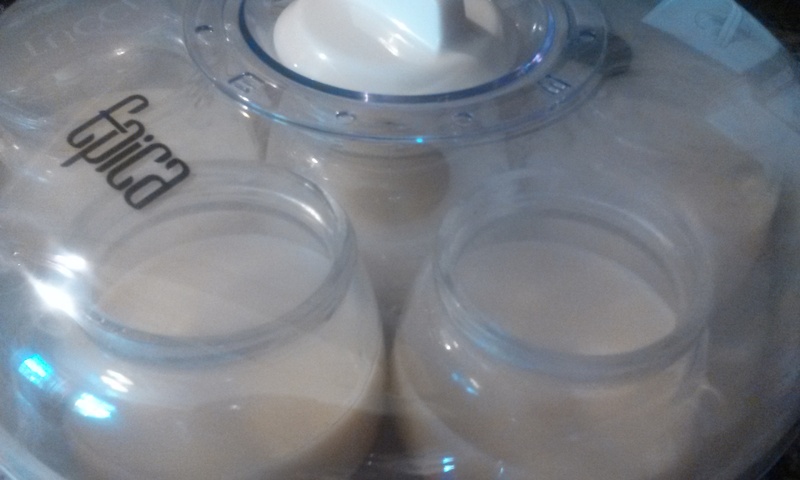 While the soymilk is cooling, consider sterilizing your yogurt jars. When the soymilk is 110F (measure!) take out 1 cup and dissolve 3 caplets of probiotic in that 1 cup, OR 1 tablespoon of your last batch of yogurt. Mix that cup gently back into the rest of the milk. You can cool the soymilk to 110 faster by floating the pot in a sink of cold water. Cooler than 110 is okay, hotter is not. If you’re adding vanilla, add a little to each jar you want vanilla flavored. Leave one jar unflavored (so you have starter next time). For beginners like me fruit should be added at eating time. Fill each jar 3/4 full and place in the yogurt maker. DO NOT put lids on the jars, but DO put the lid on the yogurt maker. Turn it on. Return in 6-8 hours (I do this overnight). Gently tip one jar. The yogurt should jiggle and bulge like set jello. When it slips, it should pull away from the side of the jar making a space there. Put the lids on the finished jars, label them with the date, and put them in the fridge. They’ll be ready to eat in 3 hours and good for 7 days. If this is too sweet for you, or not as solid as you’d like, it should process longer. Try 7-8 hours if it is just a little off or 12 hours if you want it tarter. (If you want it sweeter AND more solid, add sweetener and/or more gelatin in stage 1). No one gave me any products to try. I discovered and purchased these on my own. Epica Yogurt Maker: Also works with seven 4-oz mason jars, or four wide-mouth 8-oz mason jars. I might recommend a larger brand name, or one that has the option of a taller lid. Not sure. Yogurt Maker Automatic with Glass Jars by Euro Cuisine YM100 or Tribest Yolife YL-210 Yogurt Maker. It is YOUR job to check all ingredients and cross-contamination to see if it is safe FOR YOU. Soy milk. Non-sweetened, non-enriched (this part is important, you want to avoid the other ingredients they’ll mess up the “set” of the yogurt). We use Pacific Organic Soy Original Unsweetened. It is YOUR job to check all ingredients and cross-contamination to see if it is safe FOR YOU. Sweetener. I’ve only used honey so far, but anything sugary that the bacteria can eat. Gelatin. Many people use other thickeners. I chose gelatin because I’m familiar with how it works in cooked recipes. Date Labels. You can label any way you want. I use removable date labels. Don’t eat your first batch all at once, testing various ways of making it. There’s going to be more good bacteria in there than your body is used to. Ramp up slowly. You wouldn’t swallow a ton of probiotic pills all at once: eat your yogurt in moderation until your body is used to it. The only company making soy yogurt safe for us closed its doors in March of this year. Luckily, their product was so great, it gave me assurance that good soy yogurt was possible. Thanks to David for all the tips, and the boost in morale about the possibility of making soy yogurt at home. 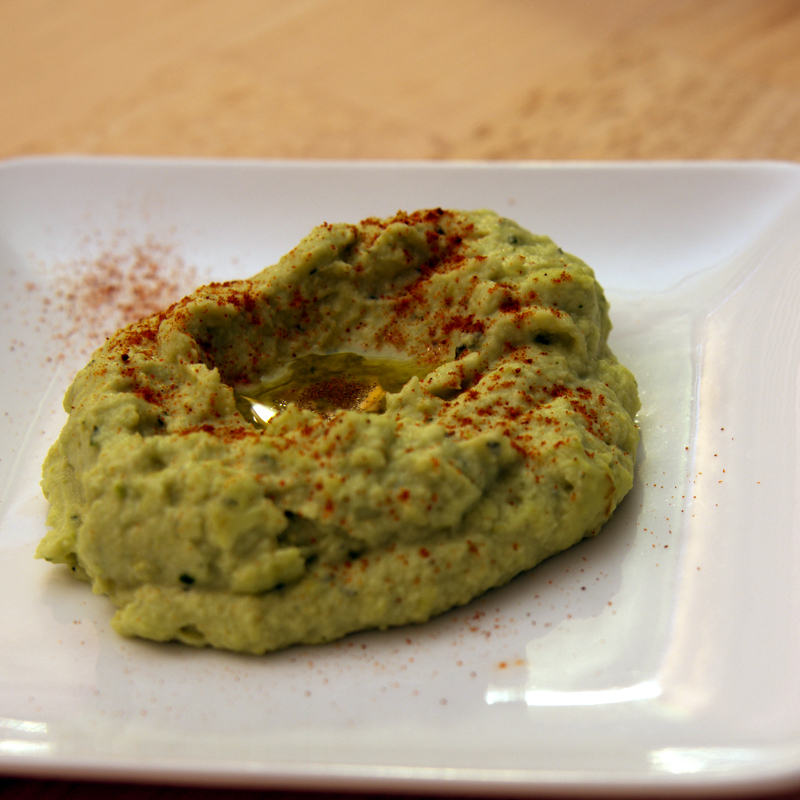 As we’re allergic to most beans and legumes (and chickpeas) I was excited by the idea of Edamame Hummous. All the ones I found on the market were combinations of chickpeas and edamame, so I tried making an edamame-only version. Get shelled edamame to save yourself some work. Enough water to see the water through the edamame when boiling in the pot. Cook the edamame in a saucepan with the water until soft enough to eat. Drain. Blend in a blender with olive oil. Add all other ingredients. Blend some more. The better your blender, the less you’ll have to scrape the edges and stir it up. My blender is just okay, so I stop every minute or so to move all the goop around, or when I start to hear the motor whirring the blades in an empty space it made in the middle of the hummous. Serve up in a bowl or on a plate. Make a little divet in the middle, fill with olive oil, and dust with a generous helping of paprika. The longer you blend, the smoother your hummous. 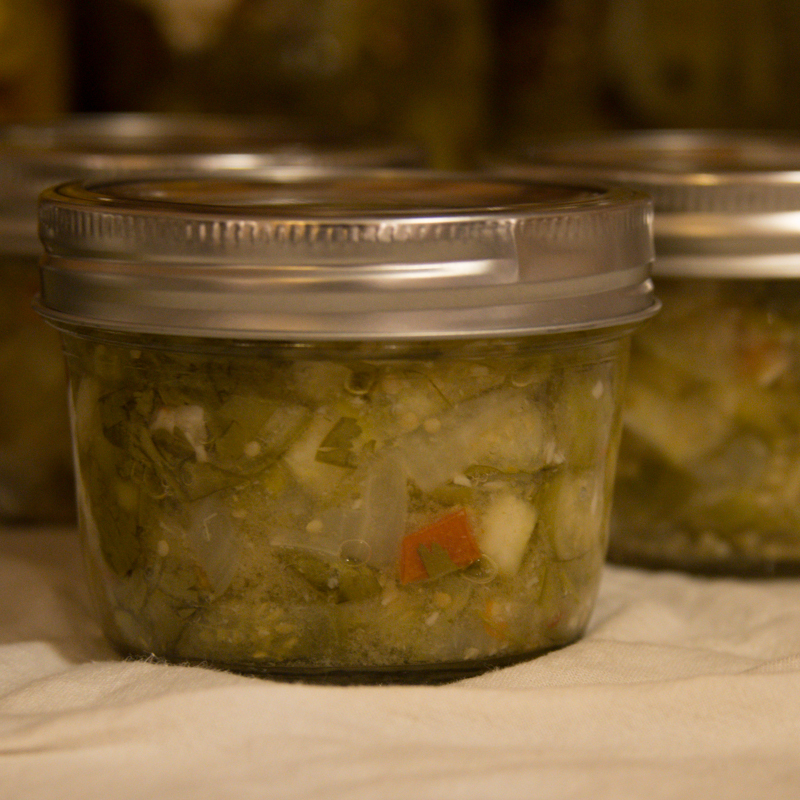 Be careful canning, follow sterile procedure to protect yourself and your food from bacteria. 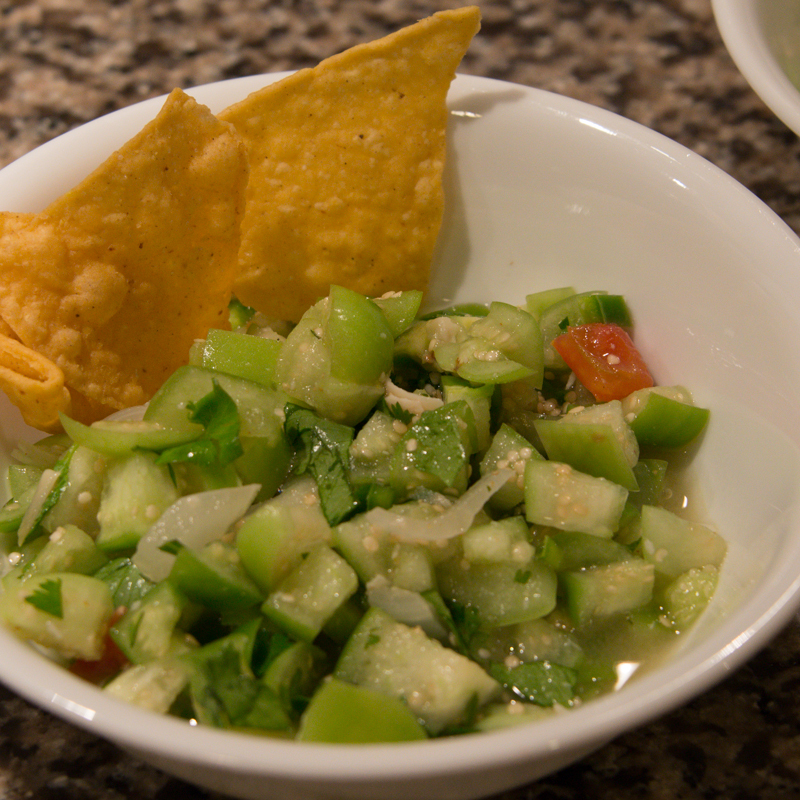 Chop everything into small bits, according to your taste for salsa. Add the roast garlic (mush it into smallish pieces and spread it through). Mix everything together. Fill your jars, wipe the rims, and process for 15 minutes in a hot water bath. Boil the brine, chop the veggies. Add the spice mix to the heated, sterilized canning jars. 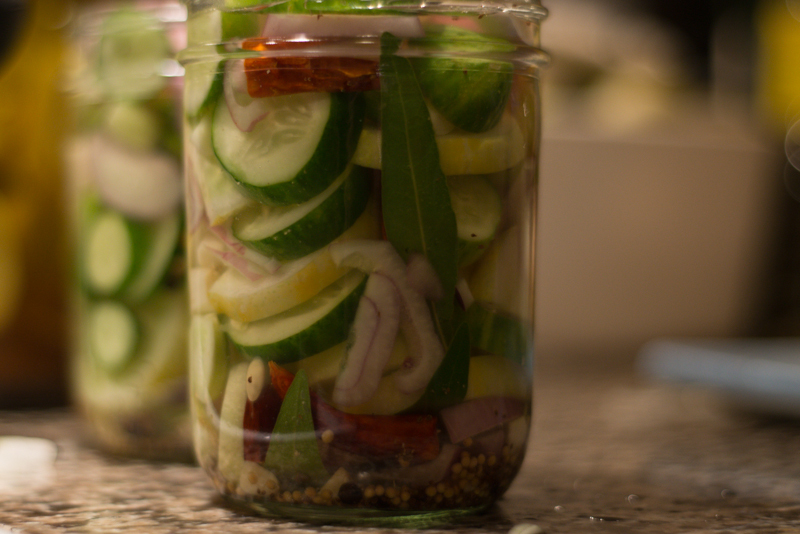 Pack the jars with the veggies, fill to within 1/2-inch of the top with the brine. Add the lids and rings, process 5 minutes in a hot water bath, cool in temperate water and put in the fridge as soon as they’re touchably cool. Potlucks and snacks can be difficult when accomodating your food allergic friends. Here are some quick and easy (some are quicker and easier) snack options that work for us. We at least won’t have problems being in the room with these items. These may or may not work for your friends. Check with them about their allergens and list of safe snacks. Here is a link to the general list of our allergies. (make sure the guacamole has no egg, mayonnaise, or milk ingredients). 7-layer dip has beans and cheese and sour cream so is out, out, out! Most flavored chips have milk powder in them … so plain or simply salted is best. Veggie dip has the same problem as potato chip dip- it’s usually sour cream or ranch dressing, both milk-based and bad. Vinaigrette dresssing (non-balsamic) is good. Most fruits are safe for us to be around. All the tropical fruits are not safe for us to eat (Mango, Guava, Kiwi … Starfruit) we can be around these fruits though. Alice is skittish about eating pineapple. It is safe to be around though. Cold cuts are fine – though we usually won’t eat them unless we can confirm they have calcium phosphate instead of calcium lactate. Mustard is safe – usually. watch those fancy mustards for odd ingredients. Olive oil and vinegar (malt, white, red wine, cider etc) are great on subs – no balsamic. Again, it is tough to find safe crackers, but we can be around them as long as they have no milk, egg, nut, cheese, or butter direct ingredients. Pate – watch for secondary ingredients. We can be around all meats, but if this is made fancy with cheeses, or if they use egg or milk as a binder, then it is not okay! Enjoy Life makes cookies we can eat: Snickerdoodles and Lemon Zest. These can be bought locally at PCC. Little Rae’s bakery uses milk and eggs, so they’re not safe for us. Lucy’s Cookies use a garbanzo-bean based flour, so they’re not safe for us. Most “allergy free” food is not free of all of our allergens, but you can always check with us about a specific brand! Do you bake? Bake without nuts, peanuts, chocolate, fennel, anise, milk, butter, eggs, nutmeg, and allspice and you should be close to something we can be in the room with. See the rest of this website for safe baking recipes, or send us your recipe ahead of time. We won’t eat food you bake due to worries about cross-contamination with whatever you’ve baked before, but we’ll love it that other people are enjoying it. If you really want us or your friends with food allergies to eat something, leave it sealed in the package until we arrive. Let us check the package ingredients, and then take what we want. Then put it on a plate for everyone else – this allows us to be in control of any cross-contamination. Please don’t be offended if we or your friends choose not to eat food your provide, especially if you worked really hard for it to be safe. Eating is so much more than an enjoyable activity, or something we do to be polite to the host. For us, ingesting food is always a life safety issue, and sometimes we just don’t want to take any risks at all. We’ll be gracious about declining, appreciate the effort, be incredibly thankful we can be in the room with the food without worrying, and just not partake. You can help by being gracious about our choice not to. Thanks! Shave the carrots into nice thickish shavings – about 2-3 inches long. Toss them with the rice wine vinegar and olive oil. Let sit for 15-20 minutes. Separate the prosciutto and turkey into individual slices, and slice in half. Wrap a basil leaf and 5-15 carrot shavings in a cold cut. Lay out on a pretty platter. Kalamata olives – ½ cup? Mix olive oil, vinegars, and shallot. Set aside. Spend this time preparing the apples. Add the spices, and mix it up. Marinade the apples. Let sit, turning as long as you have time for (a couple hours). Room temperature is fine. Grill, setting aside the remaining marinade. Grill at a low temperature for about 25 minutes, until the apples’ sugars caramelize a little but they’re still firm. Whiz the leftover marinade up with some kalamata olives. Serve the apples and tapenade together.